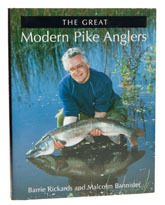 In many ways, this is the postscript to this distinguished pair's previous collaboration, The Ten Greatest Pike Anglers, which is a collection of biographies of pike anglers of long ago, but the flavour of this book is quite different. Instead of being a straight forward collection of biographies, Barrie and Malcolm opted for the more sensible approach of looking at the evolution of pike fishing over the previous half century in terms of the methods and the people associated with them. It is much more of a book about fishing than a book about individual anglers and if you are looking for biographical data about the modern generation of pike men, this isn't the place to find it, although you will be introduced to most of them. The introduction contains a fascinating chart showing the appearance and disappearance of methods over the course of the decades, before the first chapter discusses the old school - the Vincents, Dennis Pye and Geoffrey Bucknall (Geoff was still talking last time I met him, so he might be surprised to find he is part of the old school, but then I guess he is where pike fishing is concerned). From there, the authors move on to deadbait fishing, highlighting the fact that it was hardly used prior to the 1950s, which may surprise some readers. Then it is on to Holistic Piking, the development of modern lure fishing and a whole chapter on Fred Buller and Bill Giles, who, for all that we think of them as old timers, did as much between them to revolutionise pike fishing as any angler before or since. The remaining chapters deal with big catches, big waters, distance fishing, the new breed of pike angler, handling pike and much more. Whether you just dabble in pike fishing, or you eat, drink and breathe pike, this is a great book.